Inside this box is a double sided product with two goals: protect and defend your skin against the environment and increase hydration. It also hides imperfections too. This duo increases skin's hydration 8% in just one application. It boosts cellular regeneration 51% in 5 days. 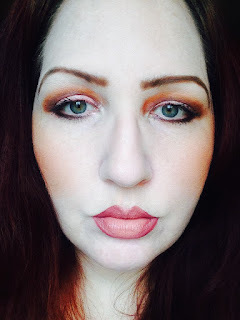 It provides a sheer coverage to hide imperfections. It reinforces the skin's immunity. It protects the skin from UVA/UVB damage. Get your day off to a great start with this healthy, fragrance-free, paraben free, all-inclusive daily wear duo that prevents, corrects, conceals, and protects in one application. First let's discuss the It's Becoming Anti-Aging Concealing Moisturizer. It is a luxurious creamy, multi-tasking formula that releases encapsulated pigment that adapts to your natural skin color to provide a light, natural coverage with a beautiful, powdery finish. It is also supercharged with the latest in plant-derived stem cell ingredients, Quercus Alba Bark Extract, designed to impart antioxidant protection, anti-microbial support and anti-aging benefits while enhancing cellular metabolism. This powerful stem cell can slow skin aging by defending against extrinsic stress, keeping skin looking youthful, longer. This formula also includes THYMULEN®4, a biomimetic peptide derived from the youth hormone, thymopoietin that strengthens skin’s immunity to fight oxidative stress and disease. So, not only does it cover imperfections, it fights off aging with anti-oxidants and peptides. Second we have the Skin Defense SPF30 UVA/UVB Broad Spectrum Sunscreen. Save your skin and keep it looking young with this naturally moisturizing, FDA-approved, broad-spectrum sunscreen. ClarityRx® Skin Defense SPF 30 is a non-irritating, non-clogging, water-resistant sunscreen that promotes a healthy glow and feel to your skin. The sunscreen comes from Octyl Methoxycinnamate 7.5% and Zinc Oxide 7%. This product corrects unsightly signs of aging such as fine lines and wrinkles and sagging with the latest in plant bases stem cell technology. It also protects the skin from premature aging. It increases cellular proliferation. The product conceals imperfections such as discolorations and dark spots with new encapsulated natural pigment. It provides a flawless finish to all skin colors. It protects the skin from UVA/UVB damage. It's Becoming can be applied in the moring along with Skin Defense SPF 30 or simply worn alone as an anti-aging concealing moisturizer for day and evening. Use 1-2 pumps of the Skin Defense SPF 30 and gently pat the product into the skin evenly. Allow to thoroughly dry. Put one pump of It's Becoming onto your fingertips and apply to your face and neck in circular motions until you see the color change. This is a game changer amongst skincare. Now we have new anti-aging skincare to use during the day that certainly helps as an advantage with peptides and anti-oxidants that are normally reserved for nighttime. It is nice to have these during the day too. And they end up working because skin is protected by the SPF 30 broad spectrum sunscreen. Not only that, but you get a concealer that adapts to your skintone and covers imperfections. What more could you want in a product? Not much, this does so many things. I am very happy with it and think this is going to be a cult hit. It is a breakout product for ClarityRx. The bottle comes with two bottles in one container with two pumps. just pump out as much as you want and voila! You have anti-aging perfection. 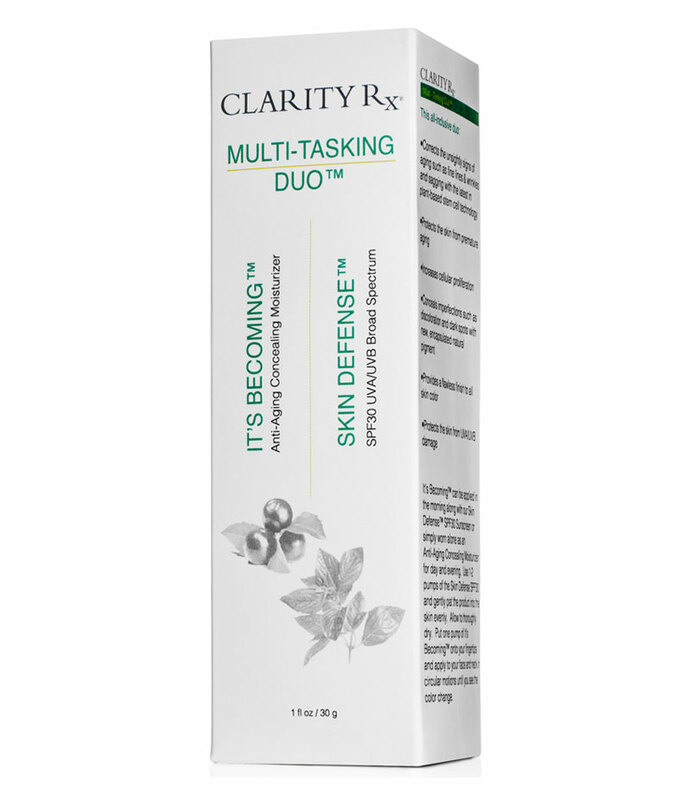 ClarityRx Multi-Tasking Duo (It's Becoming + Skin Defense) retails for $52.00. 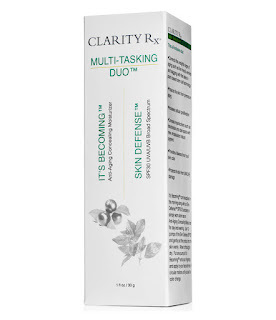 It can be found online at www.clarityclinicalskincare.com. Like ClarityRx on Facebook https://www.facebook.com/pages/ClarityRx-Clinical/223349371093050;Follow ClarityRx on Twitter:@ClarityRx; Follow ClarityRx on Instagram:https://www.instagram.com/clarityrxclinicalskincare/;Follow ClarityRx on Google+:https://plus.google.com/110513680977180016513/posts and Subscribe to ClarityRx on YouTube: https://www.youtube.com/channel/UCCoZNU5oDzRoLD2WG-zKkOg.